Cone shaped pyramids add to the magnitude of this man-made splendor. Over 100 of these pyramids ranging in size from eight to thirty-two feet are spread throughout the park..
Provenance: Gift of the Morgan F. Shirley Collection, 2009. Hey, it's there waiting for us. Conveniently located near the North Dakota border. Why not? 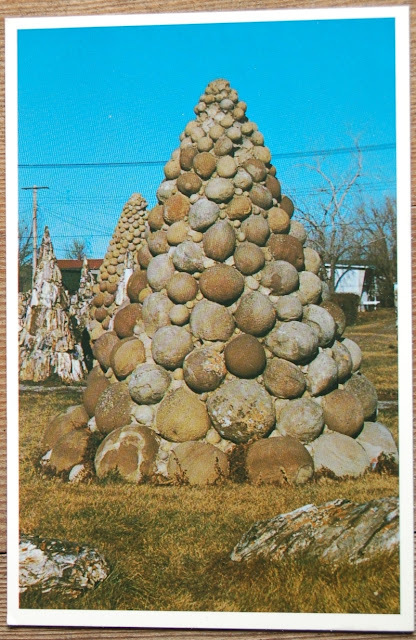 "Petrified Wood Park was built from 1930-32 by town men under the command of visionary Ole S. Quammen. "Thirty to forty otherwise unemployed men received sustenance during this period," explains a sign at the site." Ooo... I've been there! Oh, wait--now I see how you got this card. You think I could grab a bunch of "will work for food" people and have them pile rocks somewhere, then turn it into a tourist attraction? What kind of permit do you need for that? Regina has a large artificial lake in its central city park built on that concept, but a shallow lake is at least a conventional thing to have in a tourist attraction.